Forget the fast food drive-through. 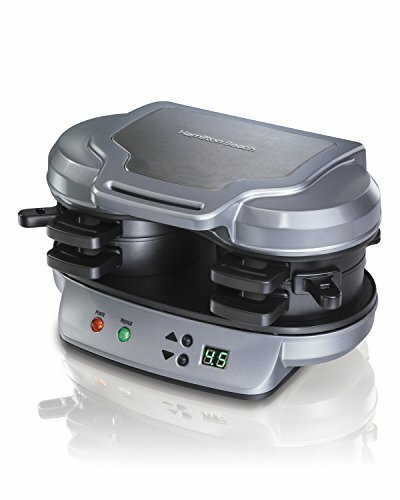 With the Hamilton Beach Dual Breakfast Sandwich Maker, you can enjoy a hot, homemade breakfast sandwich in under 5 minutes. When I reviewed this product, I simply placed the ingredients inside, build the base of my sandwich in the bottom layer, placed the egg on the cooking plate and closed the lid. I then slid the cooking plate out and my sandwich assembles itself. When I opened the lid, my hot breakfast sandwich was ready to eat! No need to worry about you sandwitch falling apart when you take it off the stove top. Awesome! I really liked the included recipe book because it provides a variety of breakfast sandwich options, from the traditional ham and eggs sandwich to the unique cheddar, apple, bacon and egg croissant sandwich. 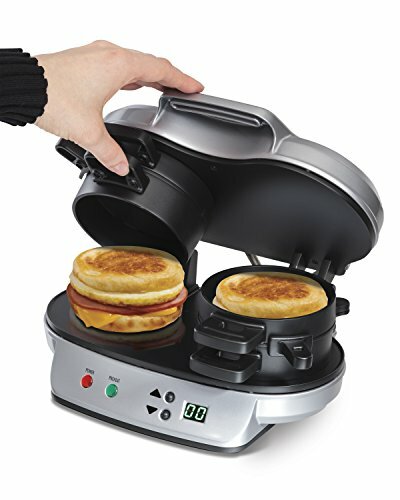 This breakfast sandwich maker makes up to 2 sandwiches at the time, which is perfect for couples or preparing kids breakfast on the go. Both sanwitches were ready in 5 minutes which gives enough time to make many more if you enjoy having a big family. Just keep in mind that the meat used must be precooked. 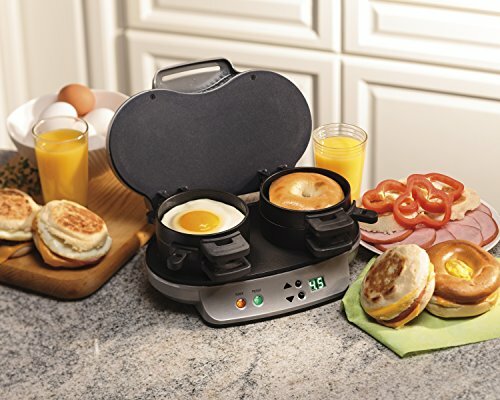 This breakfast maker allows you to cook delicious breakfast sandwiches in the comfort of your own home, while using your own fresh ingredients, including organic eggs, cheese and much more. The unit is equiped with a timer with an audible tone that makes it convenient for setting it and forgetting it. The cookbook includes many quick and easy recipes to add a welcome tasty varieties to your morning meal. Cleanup is a breeze with all removable parts that are dishwasher safe. I highly recommend this product and I encourage you to click on the Amazon link below to enjoy cooking your breakfast in no time. Enjoy!